A great many people have cellulite – some sources say that it occurs in 90 percent of women. That’s a lot of lumps! What is cellulite, anyway? Does it mean you’re unhealthy? Can you get it if you’re not overweight? Cellulite was not always considered unattractive. In days past, lumpy skin on the buttocks and thighs was considered feminine and was depicted favorably in paintings. But today, most of us consider cellulite unsightly and want to get rid of it. 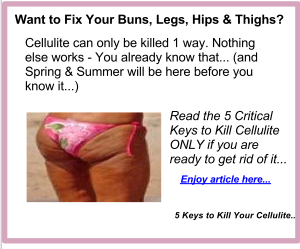 Regardless of how it’s viewed, many of us are not sure how to eliminate cellulite. Directly under the skin, there is a fat layer, particularly in women. This subcutaneous fat layer can become pitted and bumpy in appearance. Why it does so is subject to debate. But the fact that this fat layer is more predominant in women than in men has a lot to do with why women are more subject to cellulite. The jury is still out on this one. Nearly all sources agree that the lumps occur in the subcutaneous fat layer, but opinions differ as to how they get there. * Hormones may play a role, which would also help explain women’s tendency to develop cellulite. In this day and age of synthetic hormones and chemical hormone disruptors (such as some pesticides), it’s no wonder that hormonal imbalances are becoming more prominent. Hormones influence all sorts of body systems, including how the body stores fat. * Poor circulation is another possible cause of cellulite. When the circulation in a certain body area is poor, it may result in poor skin tone, “stagnant” fat cells and inadequate lymphatic drainage. These factors may come together to form the bumpy appearance of cellulite. * Heredity may also play a role. Your genes determine your skin thickness and overall body structure, which conspire to make you more or less vulnerable to cellulite. (or lack of it) in the subcutaneous tissue plays a significant role in how lumpy the fat under the skin looks. or a build-up of toxins. While cellulite is subcutaneous fat that appears lumpy, it’s not “just fat.” In fact, healthy subcutaneous fat can give you a youthful, smooth appearance, especially in the face. Some people will even have fat injected under the skin in a cosmetic procedure to “plump” certain areas of the body! 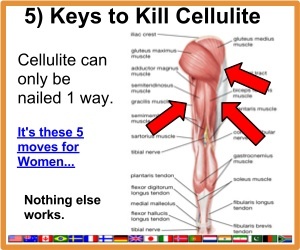 So cellulite is not just fat; it’s a particular manifestation of body fat. Not all body fat looks lumpy.